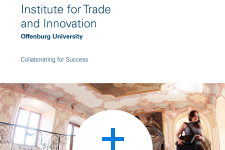 Part of Offenburg University in the Black Forest, the Institute for Trade and Innovation (IfTI) is home to leading academics in the field of trade and innovation-led economic development and growth through research covering benchmarking, strategy, implementation and process improvement. The Institute also looks for the brightest postgraduate students and doctoral researchers focusing on topics related to economic development. IfTI members have a reputation for their methodologies and methods as well as their unparalleled experience in innovation, trade policy and export finance. The Institute is uniquely positioned leveraging strategic policy initiatives, practitioner-led research and consultancy associated with trade, innovation and economic development. Recent research projects include evaluations and assessments of government programmes and the sound application of financial instruments. Members of the Institute also conduct benchmarking analyses for governments and government agencies assessing performance of foreign trade promotion instruments. A further area are research-led solutions for strategy and implementation of smart innovation and trade finance programmes. IfTI’s activities are based on an interdisciplinary approach with a cluster of economists, business and finance experts, marketing specialists and lawyers pooling their expertise to develop and implement state-of-the art results. We are the leading institute for cutting-edge research and global best practices on trade and innovation. Our research creates meaningful solutions for governments, corporates and society that have a real impact on economic development.